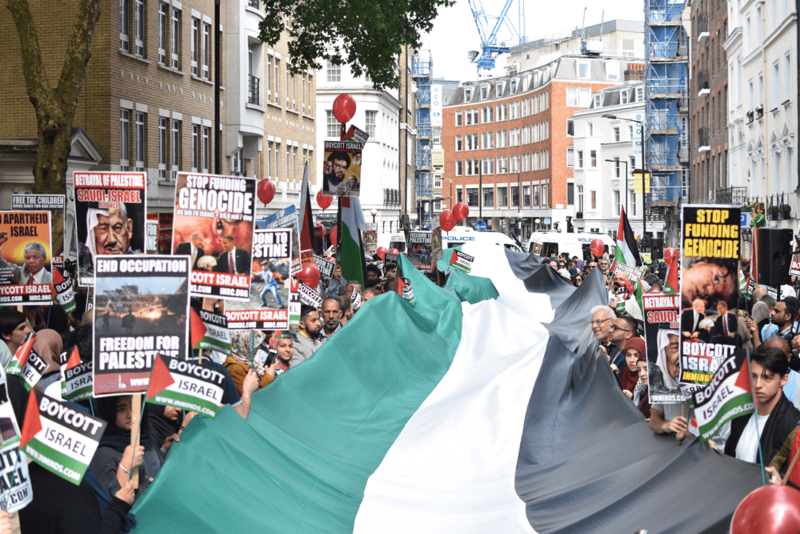 Roshan Muhammed Salih argues that pro-Palestinian activists in the West must take a braver, more pro-active stand to advance the Palestinian narrative in the face of relentless Zionist hostility. It can be really frustrating being a pro-Palestinian activist in the West because it effectively means that you have to put up with being targeted and demonised 24/7. According to the Israel lobby, if you question Israel’s “right to exist” you must be anti-Semitic; if you condemn Israel for stealing land and ethnically cleansing it you must be anti-Semitic; and if you call out Israel’s Apartheid system and its wars and oppression you must be anti-Semitic. So unsurprisingly many people just conclude that it’s not worth the bother. Being labelled a “racist” and an “anti-Semite” can have real life consequences – you could lose your job and the prospect of getting another one when your name and the word “anti-Semite” is only a google search away. Unfortunately, this is the reality for the pro-Palestine activist in the West, and there is no way of avoiding it because the only way you can appease the Israel lobby is if you give up Palestine activism. And for those of us whose hearts are close to Palestine that is simply not an option. So we have no choice but to change our mindset and accept that getting targeted is an occupational hazard. But that is not the point of this article. I don’t want to focus on how we can fend off attacks from our enemies. Rather, I want to focus on how we can go on the offensive against them, put forward a positive case for the Palestinians and relentlessly expose the wrongdoing of Israel and its supporters. But before I do that let me stress that what I am about to say is not based on my own reasoning, because as a non-Palestinian I don’t believe I have the answers to the Palestinian issue. Rather, I have gleaned these ideas from the Palestinians I talk and listen to every day. After all, it is they who are the frontline victims of Israeli oppression and therefore it is they who should be leading the struggle. Our job is to simply listen to them and support them. There is no doubt that public opinion in the West has become more sympathetic to the Palestinians over the past few decades, despite the fact that the mass mainstream media remains resolutely pro-Israel. I assume this phenomenon is simply due to the fact that it’s hard to hide the truth. No matter how hard you try to spin the facts, when Israel bombs Gaza the images speak for themselves. In addition, the rise of social media where unfiltered alternative views proliferate has been a great boon for the Palestinian cause. But despite this, pro-Palestinian activists can still advance narratives that ultimately serve the interests of Israel. They often do this to remain within frameworks of debate that are deemed acceptable in the West. One such narrative is, of course, the “two-state solution” which died a long time ago and only serves to cement Israel’s hegemony over stolen land. Another is the myth of non-violent resistance which denies the Palestinians agency and only serves to let the Israelis slaughter them with impunity. And yet another is the willingness of many pro Palestinians to normalise relations with so-called “left wing Israelis” or “moderate Zionists,” which is simply a different road to cementing Israel’s hegemony over its ill-gotten gains. So let us examine these narratives, and others, one by one. If you really care about Palestine then you need to stop talking about a two-state solution. The vast majority of Palestinians I know think that the two-state solution to the Israel-Palestine conflict is dead. Religious Palestinians think it’s dead; secular Palestinians think it’s dead; even many of those who publicly support it because they’re part of the “peace process industry” will privately admit it’s dead. What’s more, a majority of Israelis think it’s dead, including members of the cabinet. Since the Oslo Accords of 1993 the “peace process” and the “two-state solution” have been the mantras of the so-called international community which has failed to deliver either. But the truth is that Israel killed the Oslo peace process and the two-state solution by launching wars and implementing a brutal occupation. They killed it by building more and more settlements on Palestinian land and populating them with Jews from all over the world. They killed it by constructing the Apartheid Wall. They killed it by separating the West Bank from Gaza. They killed it by isolating Palestinians from the world and from each other and by making them economically dependent on their oppressors. This means that if a two-state solution were implemented today a Palestinian state would simply not be viable. After all, how can a state be viable when it has no contiguous territory, when it is under siege, when it has no control over its borders or its economy, or when it is not allowed to have an army? Not to mention the fact that while millions of Palestinians and their descendants who were ethnically cleansed from their towns and villages will not be able to return to their ancestral homes, any Jew living in any country in the world is free to go there at any time. Yet even “pro-Palestinian” Jeremy Corbyn still talks about the two-state solution (code for the destruction of the Palestinian cause) virtually every time he speaks about Palestine. He has said the UK would swiftly “recognise Palestine as a state” under a Labour government and would take steps towards “a genuine two-state solution” to the Israeli-Palestinian conflict “very early on” if Labour won a general election. Recognising a Palestinian state may well be a good thing but taking steps towards a two state solution is pure nonsense and Jeremy Corbyn probably knows it. But I guess he’s trying to become Prime Minister so he has bigger fish to fry. But I digress so let’s return to the central point: we must stop talking about two states and we must either talk about the liberation of occupied Palestine or about one state where everyone shares the land – one man, one vote. The latter could be particularly appealing to a Western audience who have been brought up on democratic principles and will find it hard to argue against. And it also has the added advantage of spelling the end of the Zionist entity. Yes, Israel has no right to exist. I’ll say that again: Israel has absolutely no right to exist. Just as Apartheid South Africa had no right to exist and was rightly consigned to the dustbin of history. And as long as we keep making the comparison with Apartheid South Africa – a white supremacist state ruling over a black majority – we will be able to steer clear of any substantive trouble. Saying Israel has no right to exist does not mean that we want to throw all the Jews into the sea, just as wanting to see the end of Apartheid South Africa didn’t mean we wanted to kill all white people. It just means that a Jewish state has no right to exist at the expense of another people, in the same way any religious or secular state does not have a right to exist at the expense of others. Of course, many modern states such as the United States of America and Australia were also built through a process of land theft and ethnic cleansing, and morally they also have no right to exist. But unfortunately these states have now been established for several centuries so the facts on the ground determine their reality, despite the undeniable moral case against them. And of course that is what Israel seeks to accomplish – to establish facts on the ground (such as settlements and walls) that make any moral case irrelevant. But unlike the indigenous people of America and Australia, the dispossession of the Palestinians is a relatively recent phenomenon and there are millions of people alive today who directly suffered it or are bearing the consequences of it. So we must fight to make sure those facts on the ground don’t become permanent. The International Holocaust Remembrance Alliance’s definition of anti-Semitism, which has been pushed heavily by the Zionist lobby and adopted by major political parties and local councils, is nothing but an attempt to stifle anti-Israel criticism and target Jeremy Corbyn. It effectively says that questioning Israel’s “right to exist” is anti-Semitic; it says that calling Israel “racist” is anti-Semitic; and it says that accusing Jews of being more loyal to Israel than their home countries is anti-Semitic. Therefore, this definition must be wholly rejected by pro-Palestinians, which in the main (thankfully), it has been. They say that it “attempts to erase Palestinian history, demonise solidarity with the Palestinian struggle for freedom, justice and equality, suppress freedom of expression, and shield Israel’s far-right regime of occupation, settler-colonialism and Apartheid from effective measures of accountability in accordance to international law”. Yet some activists who claim to be pro-Palestinian still insist on supporting this definition of anti-Semitism on the grounds that Jews and Muslims in the West must work together to combat both Islamophobia and anti-Semitism in a common anti-discrimination struggle. The naivety of this position seems too obvious to spell out and it has even resulted in Zionists having input into a recent definition of Islamophobia. My understanding of Boycott, Disinvestment and Sanctions is all-encompassing. Boycotting Israel means exactly that – a total boycott of all Israeli institutions as well as those who support them. Yet several Muslim states such as Saudi Arabia, Oman, the UAE and Bahrain have been slowly normalising relations with Israel over the past few years. This normalisation always starts off with secret diplomacy, then it moves onto cultural exchange visits, and then you get low-level or retired officials meeting each other publicly. Eventually, the leaders of Israel and these Muslim nations meet in public and formally recognise each other, paving the way for a normalisation of all political, economic and military ties. The reason why the process happens in this gradual way is because Muslim public opinion is staunchly anti-Israel, so it has to be gently coaxed in a certain direction. But make no mistake, Palestinians themselves consider this normalisation a betrayal of their cause and an endorsement of Israel’s brutality towards and dispossession of them. I tell this story because this “soft normalisation” process is happening right here in Britain between some of our biggest Muslim mosques and institutions under the guise of seemingly harmless interfaith activities. Take the annual Mitzvah Day, for example, founded by the pro-Israel Laura Marks who was Senior Vice President of the pro-Israel Board of Deputies of British Jews from 2012-2015. She also co-founded the Jewish Muslim Women’s Network, Nisa-Nashim, which earlier this year criticised the former L’Oréal model Amena Khan for denouncing Israel. Mitzvah Day is sponsored by Our Israel, Our Future which says it has been building meaningful connections between the UK Jewish community and the people of Israel for nearly 100 years. Another donor and sponsor of Mitzvah Day is the European Jewish Fund which runs projects in Israel. In terms of media coverage, Mitzvah Day was heavily promoted in pro Israel British newspapers such as the Jewish News and the Jewish Chronicle. And last but not least it was attended and endorsed by Israel’s ambassador to the UK, the notorious apologist for Israeli crimes, Mark Regev. As you will have noticed there is a common theme to all I have mentioned above – Israel, Israel, Israel. My view – based on years of reading pro-Israel media and following Israeli politics – is that the promotion of interfaith is a deliberate tactic to firmly establish Israel as a fait accompli, to neuter criticism of it and to divide groups which could pose a threat to it. It is based on the Israeli peace building industry that flourished after the Oslo Accords. But this is not peace based on justice; it is peace based on Israel keeping everything they stole and the Palestinians just accepting it. It’s like a burglar who steals your house and then says to you: you can’t have your house back but let’s be friends! The Zionists reason that if they can make personal connections with influential Muslims then it will become more difficult for those Muslims to become harsh critics of Israel for fear of disrupting those relationships or rocking the boat. So instead they may simply limit themselves to mild criticism of certain aspects of Israeli policy but never question fundamental aspects of Israel’s very nature. And of course this means that those Muslim activists who do question the way Israel was founded (through theft of land and ethnic cleansing), or how Israel has sustained itself since (through war, occupation, oppression and Apartheid), are deemed extremists who need to be sidelined. This also means that the “moderates” and “extremists” will never work together or form a united front against the Zionist enemy. And remember, as with states, this soft normalisation with tea and biscuits is just a prelude to a more formal alliance between Zionists and mainstream Muslims. Thankfully, Jews and Muslims rub along together pretty well in the West and there are no serious problems between them on a religious level. However, there is without doubt a political problem between pro Palestinians (Muslims and non-Muslims) and Zionists (Jews and non-Jews) over Israel-Palestine. So I would humbly suggest that if Muslims want to do interfaith with Jews, they should do it with the many secular and religious Jews that share our struggle against the Zionist entity. After all, it is their voice that needs amplifying, not the Zionist lobby who already have major platforms. Here’s a novel idea: how about supporting those groups who are actually on the frontlines fighting Israel and not hoping that you can sweep them under the carpet? Or worse still, sell them down the river by condemning them. Unfortunately, there are some pro-Palestinian activists in the West who would like the Palestinian resistance struggle to resemble a Gandhi-esque fight against British colonialism in India; in other words, a wholly non-violent struggle. But the Palestinians have tried that and where exactly has it got them? The Palestinian Liberation Organisation recognised Israel and committed to non-violence decades ago but that hasn’t stopped the Israelis from stealing more Palestinian land and ruling Palestine Authority areas with the iron first of Apartheid. Let’s not be shy about this – Palestinians have the right to defend themselves militarily as any occupied people around the world have a right to, while Israel is an occupying power and has an obligation to withdraw. But the key point is that non-Palestinians should not tell Palestinians what to do; our role is to simply support them. Whatever the Palestinian consensus is I’m fine with that. If the consensus is to fight Israel with arms I support that because an occupied people has the right to resist an occupation militarily. If they want to struggle by peaceful means through cultural boycotts or politics then I also support that. And if they want to do a combination of both then that’s great too. There may be many pro-Palestine activists around the world but they tend to exist in isolated bubbles. But just think how much their voices could be amplified if they coordinated with each other using modern means of communication by sharing each other’s work and messages? It’s become a bad joke how Muslims are terrible at working with each other but surely when it comes to Palestine they can put their differences aside and do exactly that? This is the one issue, after all, where there is virtually no disagreement among us. Like all Muslims across the world I have been brought up with the belief that Palestine is the central political cause of the Muslim Ummah. After all, this is the land of Al Aqsa where the Prophet (saw) performed his Night Journey; a land that was usurped by mainly European settlers at the expense of the indigenous people who still suffer to this day. But I fear that our community leaders are selling this cause out for the sake of gaining entrance into the Establishment fold. And if we don’t stop them now from going down this shameless route it will be completely normal for Muslims to work alongside those who are directly or indirectly oppressing our Palestinian brothers and sisters. Where is the shame of these community leaders? Where is the love of Palestine in their hearts? Personally, I want a Muslim leadership that will not be cowed by government threats or bogus accusations of anti-Semitism. I want a leadership that truly represents the community and not their own vested interests. And I want to be part of a Muslim community that is led by lions, not mice. Given half the chance our leaders may well sell us down the river so that they can get their knighthoods and appear on the mainstream media. So we need to hold them to account for what they are doing and keep them honest. They work for us and gain their legitimacy from us, not the other way around. To conclude I must admit that I feel that there is no solution to the Palestine issue at the moment. There is no military solution because Israel is much more powerful in this regard, and there is no political solution because the countries that supposedly support Palestine are divided and weaker than the countries that support Israel. So the only thing the Palestinians can do is sit and wait for a better historical moment and not leave the land. I know I have no right to say this living in the comfort of the West, but maybe the highest calling of Palestinians today is to literally give up any hope for a better future by staying where they are and not emigrating. I would never condemn Palestinians who choose to leave Palestine for a better life, but I only have the upmost admiration for those who choose to stay in Palestine despite the fact that they know they’re signing away their lives. But let me end with a message of hope – Israel may be sitting pretty now but will it be in in 50 years’ time? It is facing a demographic timebomb with a rapidly rising Palestinian population, and also a rapidly rising ultra-orthodox Jewish population which doesn’t serve in the army and doesn’t contribute much to the economy. Will Israel’s main backer – America – still want to support a Western colonial outpost in the Middle East when the whole region becomes less strategic with the end of the energy age? Will America still have the same cultural affinity with Israel as internally it inevitably becomes a more Hispanic and non-white nation? With the advent of a multi-polar world and rising Muslim powers, will Palestinians finally get the financial, military and political backing they deserve? None of us know the answers to these questions but I do know that time is against Israel and an argument can be made that it needs a deal more than the Palestinians do. So whether we live in Palestine or outside it, let’s not give the Israelis something now that they almost certainly will not get in the future.